again. Now they should show server1.example.com. From now on you can use an SSH client such as PuTTY and connect from your workstation to your Ubuntu server and follow the remaining steps from this tutorial. Please read the license agreement and enter Y to start the installation process or N to abort the installation. Press Y key to install the Apache when the following message is displayed: Do you want to install Apache 2.0.50 that is bundled with vtiger? Specify the absolute path for installing the Apache when the following message is displayed: Specify the absolute path for installing vtiger CRM (for example /home/vtiger) and then press ENTER. directory does not exist. Create it now? Press Y key to install the MySQL when the following message is displayed: Do you want to install the MySQL 4.0.20 that is bundled with vtiger CRM? Specify the MySQL port number, user name, and password. Installation details, such as Apache, MySQL, PHP, and GD library are displayed. Press C to continue or Q to abort the installation. Installation process takes approximately 5 minutes. Press Y to start the vtiger CRM server immediately when the following message is displayed: Do you want to start the vtigerCRM server? Otherwise, you can start the server by running the startvTiger.sh file present under the /bin directory. 1. Start the Web Browser and enter /vtigerCRM/index.php in location bar. 2. In the Registration page, complete the product registration (optional). Click the Next button. 3. In the System Check page, PHP, MySQL database, config.php, directories that have read/write permissions, and GD graphics library version status are displayed. Click the Next button. Note: Please ensure that all the directories have the read/write permission; otherwise, you cannot work with features that require file upload and download. 4. In the Database Configuration page, enter the appropriate values for Database and Site Configuration sections. – By default, Host Name is set as: . Please do not change the port number as it is added during installation. • User Name (mandatory)– vtiger (Non-editable). • Password (optional)– currently Non-editable. • Database Name (mandatory)– vtiger (Non-editable). • URL (mandatory) – Enter the host name. By default, it is http://. • path (mandatory) – By default, this is the path where vtiger CRM is installed. • Path to Cache Directory (must be writable) - By default, this is cache/. This folder is used to store the files, such as attachments, and import/export- related files temporarily. • username – By default, the user name is set as admin. • admin password (mandatory) – By default, the password is set as admin. 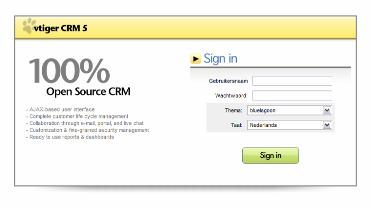 You can change password after logging in to the vtiger CRM. • email address – Enter the administrator’s E-mail address. 5. In the Confirm System Configurationpage, review the configuration information. If you want to change the details, click the Change button. If you want to populate some data, select the Also populate demo data? check box. Now click the Create button. 6. In the Create Config File page, click the Next button. 7. In the Create Database Tables page, the created database tables are displayed. Click the Finish button to complete the installation process. Wonderful tutorial. I like vtiger because it comes with everything to really test it! Is there any chance of having this updated to the latest vtiger and Ubuntu 7.04?